The new Star Trek film was a bombastic rollercoaster ride. Thrilling action and beautiful set pieces made for a fantastic time at the movies. Although even though the film clocks in at almost 2 and a half hours it feels like a bit more time could have been spent developing character motivations but overall some clever twists on the original material kept me on the edge of my seat. I do feel there were a couple missed opportunities to really shake things up and set this Star Trek apart from previous incarnations but I must say I am so glad that Uhura finally got to do her job. 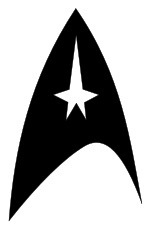 Overall I give Star Trek Into(metaphorical)Darkness 3 out of 4 stars. This entry was posted in Movies and tagged movie review, Star Trek. Bookmark the permalink.